I figure the best place to start my journey is in 2010, the year before I lost my mom. The new year started out as any new year does; resolutions, a new beginning, and another 365 days to conquer whatever you want to. This particular year started out a little differently for me. I had been planning a trip to New York City for months with my friends Natalie and Ilana. It was about a week into the new year that my parents and I drove to Chicago to stay at a hotel for me to fly out of O’Hare. The night before my flight I barely slept due to excitement and nervousness, as I had never flown before. The other thing that kept me up all night was that practically the entire state of Illinois was under a winter storm warning and I was so worried that I wasn’t going to get out of Chicago. The next morning we get to O’Hare a couple of hours before my flight. It had already begun snowing pretty good. Thankfully my flight was one of the few that was able to get out of Chicago before they started delaying and cancelling flights. I had a blast on the trip with my friends. We saw Broadway shows, met up with my friend Kevin, who is a now retired member of the FDNY, and just enjoyed the sights of the city including the Statue of Liberty. The next several months were pretty uneventful. My parents and I continued to work and enjoy our weekends at home. We celebrated my dad’s birthday in March, celebrated Mother’s Day, and Father’s Day. We had begun planning a family vacation to Upstate NY for the week after my birthday in July. Needless to say I was super excited for this trip. I’d get to see my cousins Doug and Cynthia, and Doug’s wife Gail. July came around pretty quickly and we were on the road to NY. I loved the drive because once you got out of the Midwest, the terrain got so much more beautiful. Seeing hills, mountains, and so much more. The week of vacation went by fast, but we celebrated my birthday at Doug’s house and we even spent a day in NYC. My dad got annoyed with me on the drive to NYC because Law and Order SVU was filming on location the day we went and I wanted to meet Mariska Hargitay. It wasn’t until we got into the city that my dad said we could go to where they were filming. Below are some of the pictures from our family vacation. The rest of 2010 remained pretty uneventful. When we got back from vacation we settled back into our normal routine of work and relaxing on the weekends. 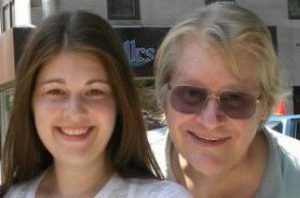 The rest of the year seemed to fly by and little did I know that 2010 would be the last year I’d get to celebrate Mother’s Day with my mom, the 4th of July, her birthday, Thanksgiving, Christmas, and NYE. In 2011 my life would change in ways that I had yet to know.